Description: Fionn Boyle comes from a long line of brave seafarers, people with the ocean behind their eyes. But he can't help but fear the open sea. For years, Fionn's mother has told him stories of Arranmore Island, a strange place that seems to haunt her. Fionn has always wondered about this mysterious island, and from the day he arrives he starts noticing things that can't be explained. He can sense the island all around him, and it feels like the island is watching him, too. 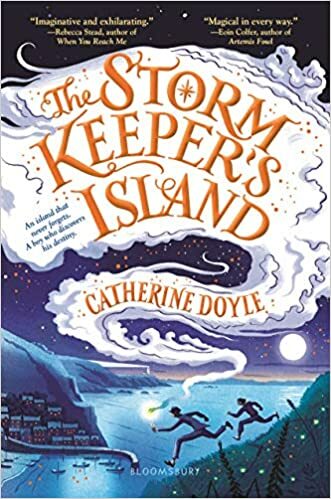 Once in a generation, Arranmore Island chooses a new Storm Keeper to wield its power and keep its magic safe from enemies. The time has come for his grandfather, a secretive and eccentric old man, to step down. But as Fionn and the other descendants of Arranmore's most powerful families fight to become the island's next champion, a more sinister magic is waking up, intent on rekindling a long-ago war and changing Fionn's life and the island's future forever. My Thoughts: Eleven-year-old Fionn Boyle has come to Arranmore Island with his 13-year-old sister Tara to stay with their grandfather for a while. Their mother suffers from depression and can't take care of them. Fionn didn't want to come. He is terribly afraid of the sea and doesn't want to leave his mother to stay with a strange man he hasn't met. Fionn's mother left Arranmore right after her husband's death and before Fionn was born. Strange things begin to happen as soon as he steps foot on the island. It feels like the island is watching him. His grandfather is rather a strange man. He is called the Storm Keeper but all he seems to do is make various candles. With Tara preoccupied with a new boyfriend, Fionn is left alone to figure out what is going on. It is time for the old storm keeper to step down and the rival Beasley family, including Tara's new boyfriend Barley, really wants the job of being the next storm keeper. It takes a while before Fionn learns that his grandfather is charged with keeping the island safe from an ancient evil named Morrigan who is sleeping somewhere on the island. There are a number of magical things about the island. The Sea Cave, if it can be found, lets the finder ask for one wish. Bartley with Tara's assistance is looking for the cave in order to ask for the power the comes along with being the next storm keeper. Fionn would like to find it too. Since he can't wish his father back alive, he'd like to have a cured mother. Fionn goes on a number of adventures with his grandfather. Each time a candle is burned, it takes the one holding it back to the time and place preserved in the wax. One of their first adventures takes them back to the very beginning when Dagda united the five clans and defeated Morrigan and her soulstalkers. This book was filled with adventures. I loved the characters especially Fionn who doesn't think that he is very courageous but surprises himself with his actions. I loved Fionn's grandfather Malachy who is nearing the end of his term as storm keeper and losing his memory. This was an excellent middle grade fantasy. "Did you just say the Sea Cave is magical? Did I hear that correctly?" "Clear as a bell," said Shelby, unfazed. "I had elocution lessons as a child. It was either that or fencing and since I'm not a sixteenth-century monarch, I chose the speech stuff." I received this one in exchange for an honest review from Bloomsbury. You can buy your copy here.